As managers of over 40 percent of our nation’s land, farmers play an important role in whether the monarch population will recover to a sustainable level. Hearing my 4-year-old daughter Daphne say the word “chrysalis” always makes me smile. First, because she so carefully articulates the word. Second, because I’m proud that she knows exactly what a chrysalis is. Every summer since Daphne was an infant, my kids and I have made butterflies, especially monarchs, part of our summer vacation education. We started by rearing lots of monarch caterpillars in our kitchen and releasing the butterflies after they emerged from their chrysalises. Now we focus more on scouting for butterfly eggs, caterpillars, chrysalises, and butterflies around our yard and farm. 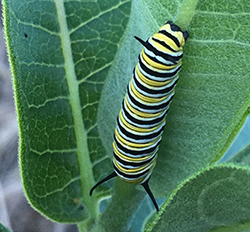 In early June, we found the first monarch eggs of the year and now we’re seeing second and third instar monarch caterpillars. We’ll raise a couple caterpillars inside this summer . . . just for fun . . . because butterfly metamorphosis is incredibly fascinating Watching the caterpillars gives us lots of opportunities to talk about butterflies, other pollinators, and their importance to our world. Come fall, we’ll track the monarchs’ amazing migration to Mexico on Journey North and then wait anxiously for the midwinter population count. We also make an effort each summer to increase pollinator habitat . . . specifically milkweed, which is the only plant monarch caterpillars can eat. Milkweed blossoms also provide nectar for bees and other butterflies. Plus, milkweed flowers have a magnificent fragrance. 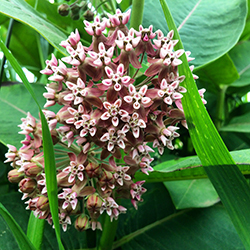 Milkweed grows well in grassed waterways, field buffers, and fence lines. But I’m inclined to believe it will grow anywhere. A couple plants popped up last summer in an old overgrown flowerbed that I planned to abandon. They came back up again this spring, so now that flowerbed has officially become a milkweed garden. My reward is that a mama monarch butterfly laid her eggs in my garden. 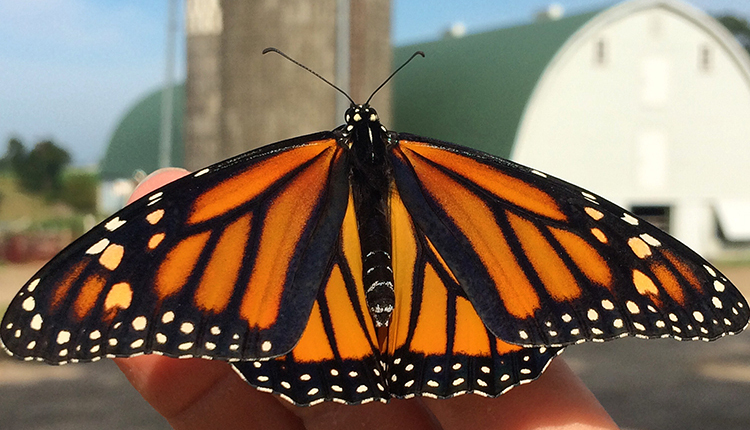 I often wish that every other farmer in America was as crazy about monarchs and milkweed as I am. As managers of over 40 percent of our nation’s land, we play an important role in whether the monarch population will recover to a sustainable level. If not, monarchs could become extinct before Daphne’s children have an opportunity to experience their wonder. If, by chance, you have an interest in learning more about monarchs, other pollinators, and pollinator habitat, there are countless resources available. I would recommend starting with a visit to www.pollinator.org and checking out their Ecoregional Planting Guides. If you’d just like something simple to do to support pollinators, consider letting a strip of alfalfa along the edge of one of your fields bloom (and stay in bloom). Butterflies and bees love alfalfa blossoms.